Buddhist-Hindu temples, homes burned, looted in Ramu, Patia… Cox’s Bazar -Bangladesh. Consecutive attacks on Bangladeshi Buddhists in Patia after Ramu… << Click here. Chittagong, Sep 30 (bdnews24.com)— Hours after rampaging through a Buddhist village in Cox’s Bazaar’s Ramu Upazila in the early hours, religious fanatics on Sunday launched attacks on Hindu temples and Buddhist monasteries in Patia at noon. Devilish Islamic persecution upon BD minority Hindu-Buddhists. 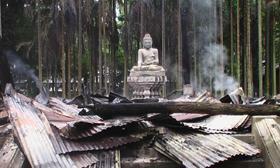 Buddhist-Hindu vicinities in Bangladesh set ablazed and vandalised in Ramu, Cox’s Bazar. Sunday, Sep 30th, 2012 | Cox’s Bazar :: Cox’s Bazaar, Sept 30 (bdnews24.com)—A mob torched and vandalised a village of Buddhists [These shrines are equally respected by the Hindus also – Ed. HE ] in Cox’s Bazaar’s Ramu Upazila early on Sunday in one of the worst religious attacks in Bangladesh apparently triggered by a Facebook posting allegedly defaming the Quran. Eyewitnesses and police said the assailants set fire to at least six Buddhist temples and nearly 20 homes and looted and damaged more than a hundred others until 3am in the hate attack. Cox’s Bazaar district’s Superintendent of Police Selim Mohammed Jahangir acknowledged the violence in the Buddhist-dominated locality. He said around 3am situation in the Ramu district headquarters was under control but in areas on the fringe, tension was palpable. Temple attacks in Ramu premeditated, deliberate: MKA << Click here. 15 monasteries torched in Ramu, Ctg; 50 Buddhist houses vandalised and Sec 144 imposed in Ramu: Home Minister Mohiuddin Khan Alamgir. Violence shocked BD PM:Report in Daily Star. Over 10 Buddhist Temples Torched over Facebook Photo… << Click here. COX’S BAZAR, Bangladesh (AP) — Thousands of Bangladeshi Muslims angry over an alleged derogatory photo of the Islamic holy book Quran on Facebook set fires in at least 10 Buddhist temples and 40 homes near the southern border with Myanmar, authorities said Sunday. Cox’s Bazar violence: 6 pagodas burnt down, 100 houses vandalised << Click here. “Police patrols have been strengthened in the Buddhist-majority areas,” SP Jahangir added. Paramilitary BGB personnel have been called out to restore order in the affected areas, Suresh Barua, teacher at a local school, said. Several houses and Mithhachharhi Bonbihar, some five kilometres from Ramu Sadar Upazila, were set on fire around 3:30am, said General Secretary of Ramu Upazila Juba League Nitish Barua. A 100-foot high under-construction Buddha sculpture was also ravaged in Bimukti Bidarshan Babna Centre in the locality, he added. Gias Uddin Ziku, Office Secretary of Cox’s Bazaar district unit of Jatiyatabadi Chhatra Dal and Chairman of Jhilangja Union, said he dispersed Jamaat-e-Islami activists who had gathered around localities of ethnic minorities. He also said he had informed the police of the incident. Local people said followers of an Islamist party led by several leaders took out a procession around 10pm on Saturday alleging that a photo was uploaded on the Facebook to defame the holy book. At a subsequent rally, they claimed a youth by the name of Uttam Barua had pasted the purportedly offensive photo in the social networking website and demanded his arrest. Another militant procession was taken out that marched down towards the Barua Parha around 11:30pm and some youths from the procession set some homes of the Buddhists on fire. From then on, 15 homes, three temples including ‘Saada Ching’ and ‘Laal Ching’ were burned to the ground, Dipak Barua, a local, said. Police, local administration officials and public representatives were trying to quell the arson and destruction that continued at least until 1:30am. A local journalist, who was hiding with family in the neighbourhood that came under attack, told bdnews24.com the Cheranghata Barakyang Temple close to his home was set alight. He said the flames died out around 2:45am. Also, Ramu Maitree Bihar, Saada Chinglaal, Ramy Sina Bihar and Jadiparha Bouddha Bihar were torched, ransacked and looted. At least 10 Buddhist villages were attacked and Purbo Merongloa locality that had around 20 houses was burned. Chairman of Ramu Upazila Council Sohel Sarwar Kajal said efforts were on to quell the tension. Several Facebook users, meanwhile, said Uttam Barua, the Ramu youth being accused of Quran defamation, did not post the photo deemed to be offensive to Islam. They said Uttam was tagged in the photo from a Facebook ID called ‘Insult Allah’ and so he was in no way responsible. Recently, there was much hullabaloo was created after Rohingya Muslims tried to cross the border into Bangladesh fleeing the religious riot in Myanmar’s Buddhist-majority Rakhine state. A section of the civil society in Bangladesh reacted to the government refusing the refugees entry. The government believes communal forces were behind this incident. Courtesy: BD News 24, The Daily Star & The Independent. Budhists &hindus have been banished from afghanistan,pakistan,jammu&kashmir,south korea(now21% budhists only,29%christians&50%are ready to accept christ),indonesia,malayasia,thailand(partly),singapore,etc !Now these two religions from same origin,same culture,same heritage,partialy same DNA(Lord budha was originaly a hindu,tried to reform hindusociety,but fails&established another cults), are carrying on fighting for internal differences&result will be so bad with ending both hindus&budhists ! Dalai Lama is in not in position to defend itself.He is parasite in in india&for hindus. He is doing politics only&his politics fails in islamists,he can survive only with hindus&in india. Why does he not declaring tibet to be state of india?He can not fight with China alone ! He is involved in conversion in budhism from hindus,but he can not dare to do so with islamists ! He is aware of results of past history,he is not ready to accept realities ! It will most welcomed in hinduism from budhism,the only roots! This entry was posted on September 30, 2012 by hinduexistence in Attack upon Hindu Temple by Muslims, Attack upon Hindu-Buddhists by Muslims, Attack upon Hindus by Muslims, Buddhists are under Islamic attack, Hindu - Buddhists attacked in Bangladesh, Hindu Buddhist Unity, Save Buddhist - Hindu Shrines in Bangladesh, Torture upon Hindu - Buddhists in Bangladesh, World under Islamic Aggression and tagged 100 yrs Buddhist Monastery destroyed in Bangladesh, Buddhist-Hindu temples - homes burned - looted in Ramu - Bangladesh, Buddhists - Hindus attacked in Bangladesh, Cox's Bazar : Islamic persecution upon BD minority Hindu-Buddhists, False Quran desecration ignites communal vindication in Bangladesh, Islamic persecution in Ramu - Chitagang - Cox's Bazar - Bangladesh, Myanmar repercussion in Bangladesh, worst religious attacks in Bangladesh.